And as the magic begins, you can tell that author Carol Shaver spent time telling stories to children. 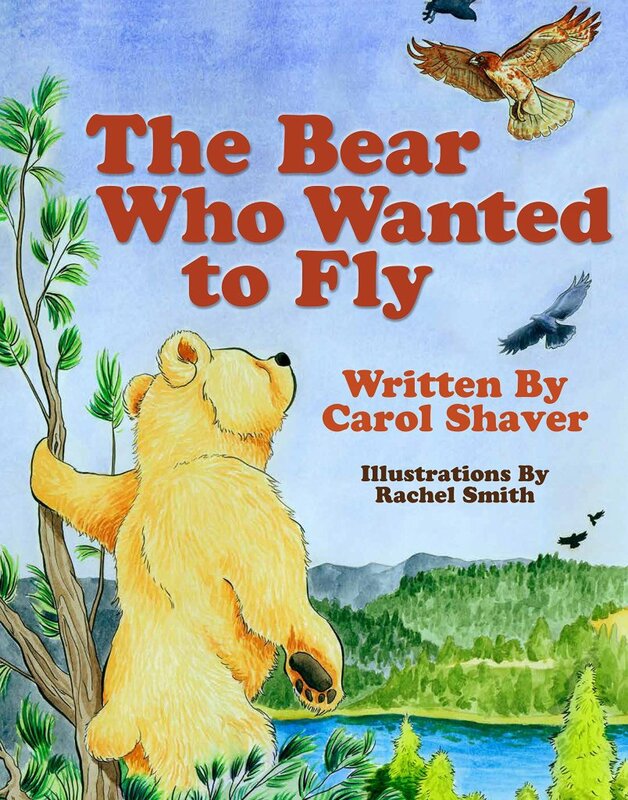 The Bear Who Wanted to Fly is always packed with warm enthusiasm — along with lots of extra adjectives. Right from the first page, I also liked the bright illustrations by Rachel Smith. Their clean, simple style suggests a sunny day with some friendly animals. “The bear was sitting high up in the pine tree,” the book begins — with a lovely picture of the bear gazing out at a blue mountain sky. He’s perched on branch overlooking a dark blue river, and the simple drawing of his tree even includes a bird’s nest! For weeks, Cubby the bear had watched as the birds “swoop and dive and frolic in the air.” And then suddenly the bear reaches a conclusion. It must be the feathers…. I hoped that kids wouldn’t get the wrong idea, because that’s never going to work. But the book makes that clear, and I really loved all this book’s colorful details, and the way it still found its way to a warm and happy ending. It’s fun that the bear is watched by “the inquisitive squirrel twins,” Chatter and Crunch. They see him scurrying around to collect feathers — beautiful feathers — and storing them in a “saving place” in the forest’s Grand Pine Tree. There’s real children’s-story drama — and amazingly, a very happy ending, as all his forest friends rush a pile of autumn leaves under the branch where the bear will inevitably fall. “Friends help friends…” the squirrels say at the end of the book. And they even arrange a special ride for him on the back of some eagles, so he gets to fly after all.